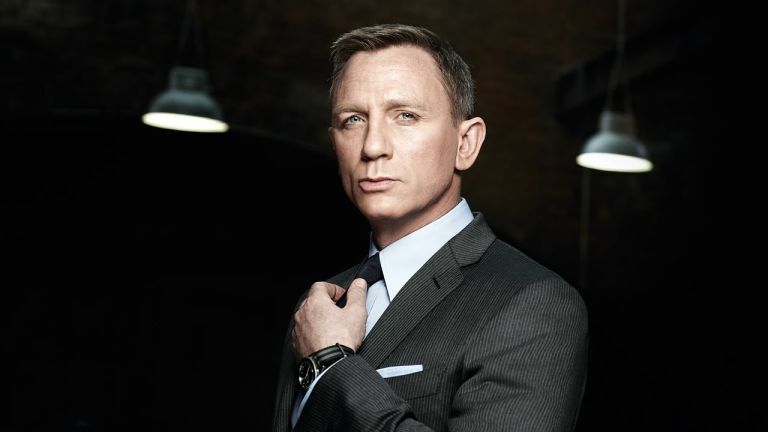 Where would James Bond be without his wristwatch? Late, perhaps, but given they feature Q-Branch lasers, grapple hooks and even messages dispensed via ticker tape like a tweet from the Seventies, 007’s timepieces have often served roles as mission-critical as his Aston Martin, Walther PPK and raised eyebrow. From Sean Connery’s Rolex Submariner with NATO strap, to Roger Moore’s Seikos and the Omega Seamasters of Pierce Brosnan and Daniel Craig, Bond has always maintained an enviable watch collection. Believed to be Sean Connery’s own watch, this Rolex was worn by the actor as he played Bond in the first four films of the franchise. It was paired with a range of straps during its film career, including a striped fabric NATO band. If you want to wear a Rolex 6538 then be prepared to pay a lot of money for it. Examples have sold at auction for almost £200,000 in recent years, while we found one currently for sale for £220,000. Curiously, the actual watch worn by Connery was sold at auction in 2016 for $60,000 (£43,000). Bargain. Bond’s love of traditional watches from Rolex and Omega has occasionally made way for an oddball or two. The first of these is the Hamilton Pulsar P2, worn by Roger Moore in Live And Let Die (1973). The first mass-produced digital watch, the P2 displayed the time with LEDs - and, much like recent smartwatches, would only do so when you pressed its one button. Curiously, setting the time is done by removing a magnet from the clasp and holding it against the hour and minute positions on the back of the case. There is no date or alarm function, and despite costing the same as a Rolex Submariner at the time (also worn by Bond in Live And Let Die), history has not been as kind to early Pulsar P2 owners. You can pick one up today for around £800. Sticking with digital wristwear, Bond opted for a Seiko 0674-5009 for The Spy Who Loved Me (1977). As well say showing the time, day and date, Bond’s Seiko was given the Q-Branch treatment and fitted with a ticker tape messaging system. Because several Seiko watches of the era look very similar to the 0674-5009 worn by Bond, it can be difficult to find exactly the right one. But when you do we have some good news, because they only cost around £200. Today, watchmakers would take a film producer’s arm off for a chance to be featured in a new Bond film, then produce a limited edition model with its own global advertising campaign. But back in the Eighties, things were different. Just how different is highlighted by the heroic two-year effort by watch aficionado Dell Deaton to identify the Tag Heuer Professional Night-Dive 908.031 worn by Timothy Dalton as Bond in The Living Daylights. Dalton’s conclusion was made by analysing a blurry 10-second clip over and over, eliminating possible alternatives until he had, with a claimed 80% certainty, found the answer. The only unknown is whether the watch had a Tag Heuer logo, or if it just read Heuer, as the film was being produced as Tag acquired Heuer and watches were produced with both styles of logo for a brief period. Very rare but not massively expensive, the only Tag Heuer to be worn by James Bond is worth in the region of £900. After a 15-year break, 007 returned to Rolex when Timothy Dalton played Bond in 1989’s Licence To Kill. Echoing those of Connery and Moore, Dalton wore a Submariner Oyster Perpetual, but this time the newer 16610, which saw several updates until production ended in 2010. This Rolex was also the last to be worn by James Bond, as for Goldeneye (1995) Pierce Brosnan began the spy’s relationship with Omega which has endured to this day. You should expect to pay around £5,000 for a mint condition model from 1989, or roughly £1,000 more for a newer example. Known to millennials the world over as the James Bond watch, the same model of blue-faced Omega Seamaster made an appearance in every Brosnan film. Water resistant to 300 metres and with a helium escape valve, the Seamaster is the sort of fully-fledged diving watch you’d expect from a commander of the Royal Naval Reserve. Q-Branch gave the Seamaster a laser for cutting through ice, a grappling hook and detachable explosive charge. 006 agent Alec Trevelyan, played by Sean Bean in Goldeneye, wears the same model but with a black leather strap. A second-hand, mint condition Seamaster like Bond’s with box and papers will cost you in the region of £1,100 to £1,800. In 2002 Omega produced a special edition with 007 motif on the face to celebrate 40 years of the James Bond franchise, and for this you’ll need to double your budget. Finally, here is the Omega Seamaster worn by Daniel Crain in the most recent Bond film Spectre. First introduced in 1957, the Seamaster 300 is a diving watch with a 41mm stainless steel case. A version made in collaboration with the film and limited to 7,007 examples (see what they did there?) includes a 007 motif on the clasp and a striped NATO fabric strap. Priced new at £5,040, this watch is already fetching almost £8,000 on the second-hand market, so if you can find one at its RRP you should be able to turn a quick profit.